(Nanowerk News) Natural channel proteins are integrated into artificial membranes to facilitate the transport of ions and molecules. Researchers at the University of Basel have now been able to measure the movement of these channel proteins for the first time. They move up to ten times slower than in their natural environment, namely the cell membrane. As reported in academic journal Nano Letters ("Dynamics of Membrane Proteins within Synthetic Polymer Membranes with Large Hydrophobic Mismatch"), the results may prove useful to the ongoing development of new applications such as nanoreactors and artificial organelles. The membranes of the cells in our bodies are only approximately 4 to 5 nanometers thick and consist of a complex mixture of lipids and specific membrane proteins, which also include channel proteins. 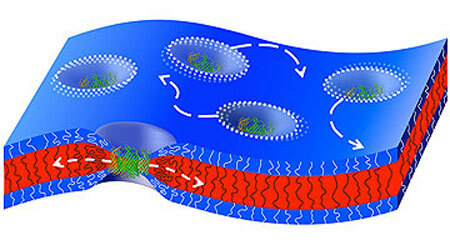 This kind of cell membrane can be described as a fluid 2-D solution, in which the components are able to move laterally. These movements within the membrane are dependent on the flexibility and fluidity of the components and ultimately determine the functionality of the membrane. Chemists at the National Center of Competence in Research (NCCR) Molecular Systems Engineering working under Professor Wolfgang Meier and Professor Cornelia Palivan from the University of Basel have now integrated three different channel proteins into artificial membranes of 9 to 13 nanometers in thickness and have measured their movements for the first time. The researchers began by creating large membrane models with embedded and dyed channel proteins; they then put them on a glass surface and measured them using a single-molecule measuring method known as fluorescence correlation spectroscopy. All three channel proteins were able to move freely within the membranes of various thicknesses – this took up to ten times longer than in the lipid bilayers of their natural environment. In thicker membranes, the building blocks of the membrane (polymers) must be able to condense around the channel proteins in order to alter their fixed size. To do so, the membrane building blocks have to be sufficiently flexible. This had already been described in theory. The researchers at the University of Basel have now been able to measure this in a practical experiment for the first time, demonstrating that the thicker the membrane, the slower the movement of the channel protein is in comparison to the movement of the actual polymers that form the membrane. “This phenomenon is effectively a local decrease in fluidity caused by condensation of the polymers,” explains lead author Fabian Itel. In essence, however, the behavior of the channel proteins in the artificial membranes is comparable to that in their natural environment, the lipid bilayer, with the time scale of the movements being approximately ten times lower. The research project received funding from the Swiss National Science Foundation and the NCCR Molecular Systems Engineering.